Spanish Primera Division soccer club FC Barcelona is to open a training camp for children in Russia, according to a press release published on the club's official website. Besides Sochi, Barcelona's board of directors has also decided to open schools in Tokyo and Copenhagen this year. 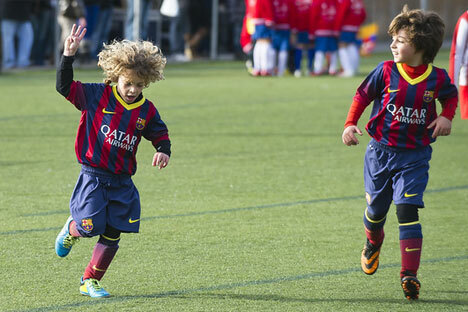 Barcelona sports schools are now operating in Spain, Ireland, the UK, the U.S., Japan, Italy, Croatia and Luxembourg, and accept children from 7 to 15 years old. In Sochi the club plans to open a training camp for young footballers divided into two campuses, with courses lasting a week. It is not clear yet how many children the camp will be able to teach and how the pupils will be chosen. The training camp in Sochi is not the first educational center for children to be opened in Russia by a leading European soccer club. A branch of Ajax Amsterdam's children's soccer academy operates in Moscow and trains children from 6 to 12 years old. Read more: A year after the Olympics: What does Sochi look like now?